BEBP Development Company LLC (a joint venture between Bergen Egineering Company and Branca Properties, Inc) and Episcopal Community Development, Inc. (ECD) is pleased to present Franklin House Senior Apartments, an affordable 94-unit housing community for people 55 and over, located on Mill Street off Main Street in Franklin Borough (Sussex County), NJ. ECD is a non-sectarian, not for profit community development organization. 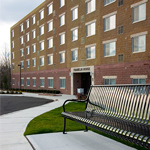 Beautifully situated in the Highlands Region of Northern NJ, Franklin House offers residents modern, independent living in a serene natural setting, within easy proximity to municipal services and retail services. The units enjoy views of the surrounding woods and hillside. *Financed through NJHMFA. Minimum income limits apply. Rents and gross income limits are subject to change in accordance with federal income guidelines. Tenant or co-tenant must be 55 years or older. Apartments are leased on a first-come, first-serve basis to qualified tenants once formal applications are received.